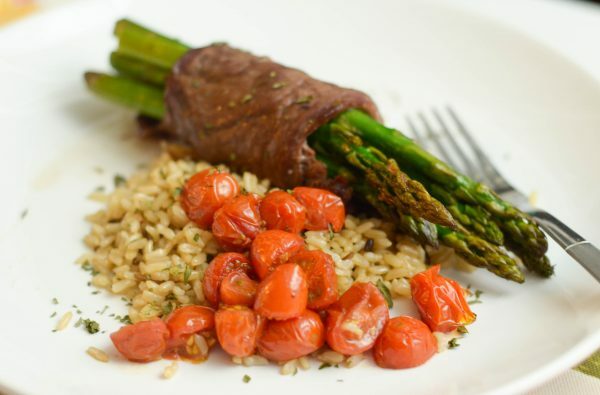 This Steak Wrapped Asparagus is the perfect better-for-you meal that will melt in your mouth! The steak should be marinated the night before, but cooking is a breeze. Just before the New Year, my husband and I started off on a journey for better overall health. Of course, the natural thing to think of is to start exercising, which we have both done, but we also had to redo our diet. The tricky part for me was to eliminate all the snacking that I didn’t actually realize that I was doing. Who knew that a little handful of chocolate chips actually has calories that, even though I say they don’t count… my body doesn’t agree! In this journey though, we realized most of our dinners were healthy already but we did need to do some tweaking. 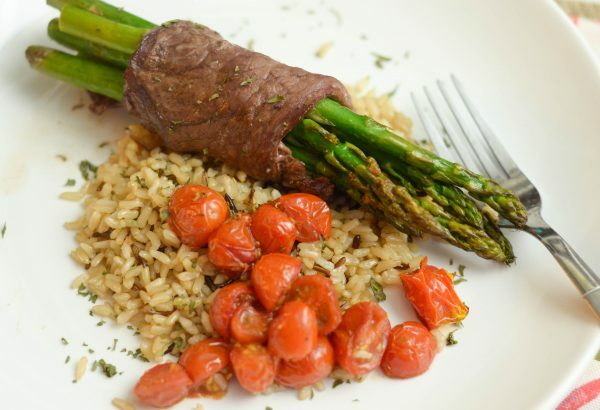 How do you make Steak Wrapped Asparagus? For instance, replacing some not so great carbs for some better carb options and not as many carbs either. 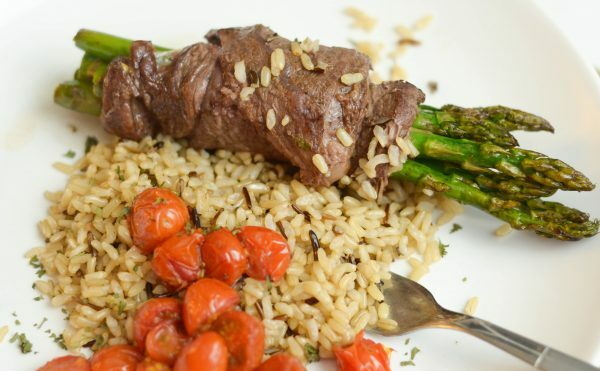 That led us to this delicious steak wrapped asparagus with a side of wild rice. It was so good; I got excited just preparing it. I glazed it with balsamic vinaigrette, then baked it in the oven. 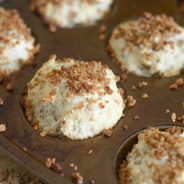 It’s honestly a one-dish meal too outside of the rice; however, that does not take long to prepare at all. It was certainly a win for dinner and one that we will now be making regularly. 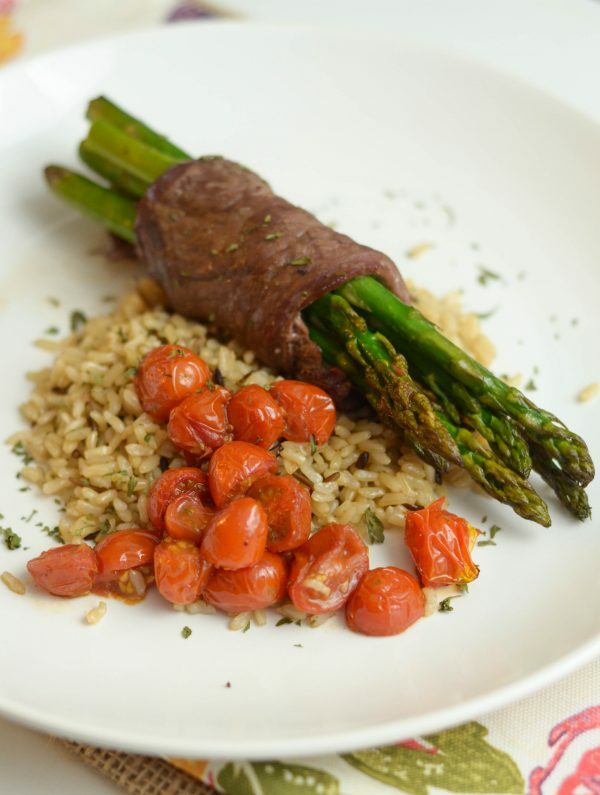 What should you serve with Steak Wrapped Asparagus? It was also delicious asparagus too; the asparagus was nice and tender with a little bit of crunch. I find sometimes asparagus can be a little too soft, this was just right. I also added in some grape tomatoes too that provided a great boost of flavor too, those also received a nice glaze of vinaigrette too. The key here is to marinate the dish for a few hours before serving. Personally, I think it’s best if you make it in the morning and let it marinate all day, then when you get home from work all you need to do is warm up the oven and bake it. That makes it a simple meal to prepare and have ready for dinnertime. 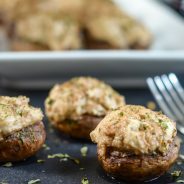 Are you ready for a bite? I am!